When I was younger, I used to spend a lot of time coming up with outfits. Usually on a school night, after I finished my homework, I’d try on different outfit combinations in my room, styling and fussing, before ultimately landing on what I would wear the next day. I would lay it all out on my desk chair so it’d be ready to grab the next morning as I’d be packing up to leave for school. Grand total time-wise: we’re probably looking at an hour to an hour and a half — and it was a great way to remind myself of what was actually in my closet and how to combine those pieces, old and new, together. Fast forward to today, as I’m sure most of you can relate, an hour and a half to come up with an outfit is a luxury only known to, well, no one living and working in New York City that’s for sure. Most mornings are early starts with very little downtime, leading up to evenings with multiple events lined up, before collapsing in a pile in front of my laptop to get caught up on emails. Somewhere out there, in an alternate universe, my younger self is crying in silent, sartorial defeat. Thankfully for her (and for ME), there are a few styling tricks I pick up each season that get me the mileage I need for far from boring outfit combinations when you’re in a pinch for time. And I have the ladies of New York to thank for them. 1. Belted blazer: Perhaps my favorite and most abused styling trick of them all. Sure, a blazer with jeans always looks chic. A blazer with jeans, with an amazing belt cinching you at the waist? Even better. My personal go-to these days has been to wear my blazer paired with a midi skirt, usually in the same color family as the blazer (foreshadowing to tonal dressing below) with a thick waist belt. I’ve been styling this borrowed Balmain belt the past few days and it’s definitely tempting me to pull the trigger. 2. Boots with midi skirts/dresses: Chic and functional, boots with midi skirts and dresses are the perfect way to block out any winter breeze while still looking like a 70s babe. Lately, I’ve been opting for slouchy boots and the snakeskin variety (especially with printed dresses) — it’s unexpected and I love it. 3. Tonal dressing: Season after season, this one never fails me. Try digging through your own closet and taking note of what colors you tend to purchase the most. Personally, I have a lot of whites and creams, which is why a nice winter white look usually makes multiple appearances for me throughout the months ahead. I’m working on a project at the moment with Ted Baker and I think green, particularly a dark emerald green, will be my next tonal moment — think Meghan Markle in this outfit. 4. Silk slip dresses with knits: If you recall yesterday’s post, I’m a sucker for blending evening dressing with comfortable knit wear — it means you’re ready for practically anything. Heading out for a last minute dinner party or staying in catch up on House of Cards. My personal favorite combination lately is to wear an oversized knit over my dress or skirt without trying to tuck it or gather it at the waist. I rather like the shapeless effect, especially with a pair of tall slouchy boots. 5. Let your earrings do the talking: The other day, I was shooting with my good friend Helena, when a reader came up to say hello and said she recognized me because of my earrings. These earrings in fact. And I don’t blame her either. I am a repeat offender when it comes to those earrings and truth be told, they usually guide the rest of my outfit. They’re statement for sure and sometimes, it’s nice to let the accessories be the true icing of an outfit. A chic turtleneck with jeans and a camel coat with a great pair of conversation starting earrings goes a LONG way. Trust me. And takes less than 2 minutes to put together. How about you guys? Any styling combinations that save you when you’re running late? And in case you’re interested in the Yoox pieces I’m wearing here, I rounded up my favorites from their Ice Collection, which features over 100 up and coming Italian designers. Happy shopping! 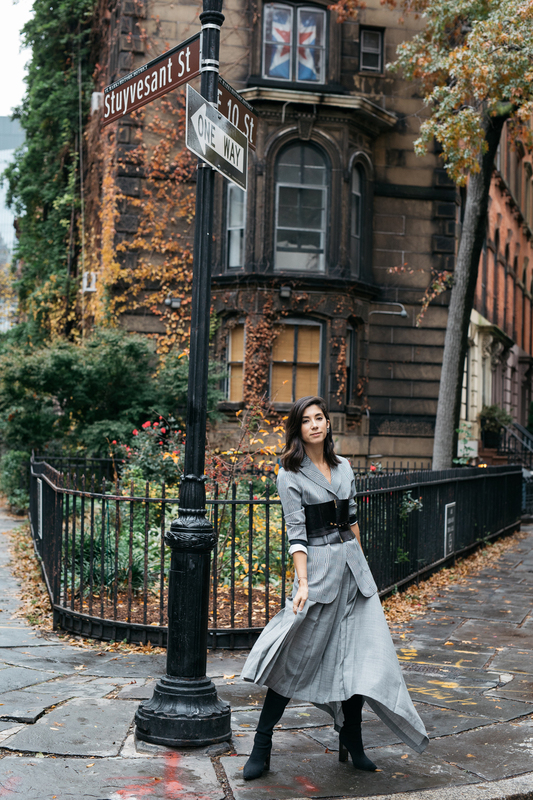 Style and fall outfits, new york city, nyc, style. This combo is so inspiting. Love this belted blazer! Love this look and this red touch is perfect! Love how you styled the outfit. Thank you for sharing the tips.